The classroom setup was a family affair. The future brothers and sisters were assembled on the floor of a small circular auditorium and the parents were seated above. It was kind of like watching a mini version of Spartacus ... there were even a few tiny gladiator fights that broke out spontaneously. Nikki ... to her credit ... sat attentively and even counselled some of the smaller children on the proper etiquette of sibling classroom behavior. She was about 3 years older than most of them. Then the moment arrived when the "babies" were handed out to the restless crowd for hands-on training in diaper changing, burping, etc. The "babies" were, of course, life sized dolls that came in different sizes and colors. The dolls were handed out one at a time. Nikki was toward the back of the pack and was handed the last doll of the batch. It was a black doll. Nikki stood for a while with the doll in one hand ... the other hand on her hip (I knew what that stance meant and held my breath). She arched her eyebrows, looked at the nurse and at the doll a few times and then looked up at us. I motioned to her emphatically to sit down and listen to instructions. There was a black family sitting next to me. The husband whispered ... "She must be yours." I said ... "I'm not sure ... I'll tell you in a few minutes." Nikki walked up to the nurse and pulled slightly on her sleeve. 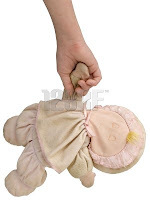 The doll was dangling in her hand. The nurse stopped in midsentence and my heart dropped to the floor. Nurse ... "Yes dear is there something I can do for you?" "Well you see ..." Nikki said, "this is a black baby." "Well .... I am white and we are having a white baby. Can I trade?" The family next to me roared ... so did the entire audience. Cute! Just what I needed today :) Keep up the great writing!